Check out the Apoplexy Tiny Letter for a soundtrack while I wend my way. By dint of their setting, many of my stories – and long-suffering readers of the blog won’t be surprised by this – end up being not just about their primary through line, but also having a kind of B-line about what Scotland is. Perhaps that’s also not surprising, because borders and places where ideas meet, places where there’s perhaps a mental incongruity, are interesting places to mine artistically. Scotland is both a nation and not, for the purpose of international law, a State. And there’s a tension and a friction in living that. 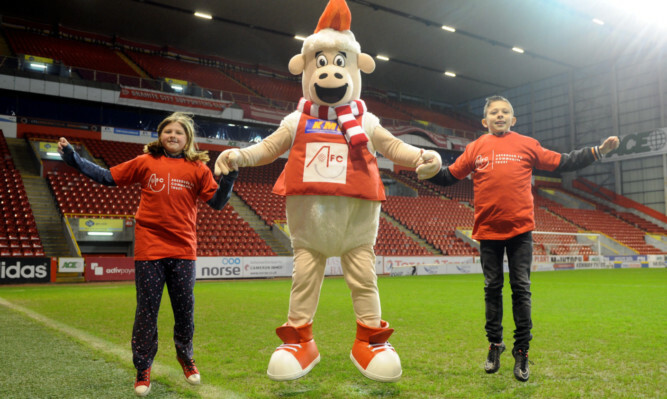 Yes, I know Aberdeen’s 120-odd miles from Dingwall. But I’m just a typical Central Belt city-slicker, amn’t I? I think the reason I was thinking about all this was because I was on my way to Monarch of All it Surveys? a talk at the National Gallery of Scotland by Dr Jonathan Murray of the Edinburgh College of Art considering the history and enduring cultural resonance of Edwin Landseer’s 1851 painting The Monarch of the Glen. Yes, you know it. It was purchased by distillers Dewar and Sons in 1916 and used as their trademark for many years. It’s also been used on the label of tins of Baxter’s Royal Game soup. But maybe you weren’t born within a ladle’s length of the Baxter’s factory in Fochabers. And maybe your go-to well whisky for over a decade wasn’t the Dewar’s whisky that’s so ubiquitous in New York City. 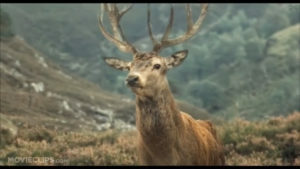 As an academic and critic in film, Jonny Murray noted the reference to Landseer’s image at the climax of the 2006 film, The Queen. 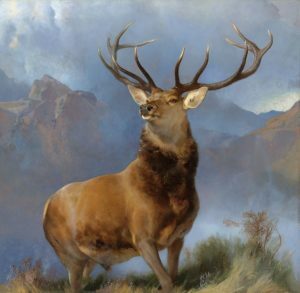 Also, that Peter Blake painted a version, After ‘The Monarch of the Glen’ by Sir Edwin Landseer for Paul McCartney’s Mull of Kintyre property. And that Peter Saville – of New Order album covers fame – painted another version. I learned that Landseer, critically and commercially successful in his time, had quickly fallen out of favour with the art establishment after his death. 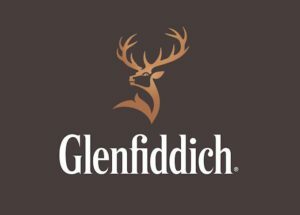 And that, his work has been somewhat re-evaluated in more recent years, with the National Galleries of Scotland acquiring the painting from the multinational drinks company Diageo at half its appraised value after a public fundraising campaign. Sinclair’s thoughts weren’t entirely complementary, it turns out. 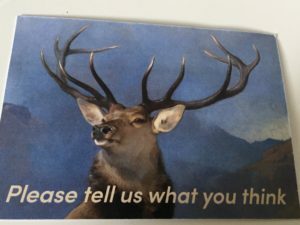 At the end of the talk, members of the audience were presented with postcards from the National Galleries, asking us What do you think is the relevance of [The Monarch of the Glen] to Scotland today? I think that it’s only an illustration of the past today’s Scotland emerges from. The Monarch of the Glen was painted less than sixty years after the Ross-shire Sheep Riots. Landseer was painting a picture of an imagined Highlands commissioned as part of a series of three panels to hang in the Palace of Westminster in London; the Refreshment Rooms of the House of Lords, to be more exact. The painting went on to be held in a series of private collections, and it sold widely in reproductions in steel engraving thought the 19th century. Landseer had a ready audience among the landed and hunting set for his paintings depicting The Hunt. What’s interesting to me this week is that the setting of the painting – an idealised portion of Scotland that could be Glen Africc or Glenfeshie or Glen Orchy or Glen Quoich – is empty. This Scotland of Edwin Landseer and his patron Walter Scott contains a Highlands which fills two-thirds of the total area of Scotland. That Highlands contained almost half the population of the country just a few years after the Ross-shire Sheep Riot, and had less than a fifth of the population when The Spectator article linked above was written, to allow room for sheep and hunting estates and the Balmoralisation of the area. Now, the Highlands and Islands are subject to various attempts at local community buyouts, and it’s recognised that what is seen at the natural, rugged beauty of the Highlands isn’t as unnatural and untouched as we might believe. So, I suppose that’s my answer to the National Galleries’ question, What do you think is the relevance of [The Monarch of the Glen] to Scotland today? It’s a picture depicting a cautionary tale. But when we’re talking about cultural resonance and the depiction of Scotland, I’m glad that I grew up in an era when I could be exposed to something Jonny Murray has written about in the day job – Comfort and Joy and the other films of Bill Forsyth – and more recently I’ve been able to read books like those of Alan Warner. In a country where film and literature is set in, and comes from, places that are recognisable to a Scottish kid. If you have any reflections on Landseer’s painting, the National Galleries of Scotland are interested to hear about them at the link above. Dr Jonathan Murray’s talk on The Monarch of the Glen is available in its entirety below. Interesting thought arises. Where do echo of the past, idiom, archetype and appropriation intersect? I don’t really have a good read for what makes kids think something is appropriation – clearly some combination of borrowing and quoting with economic power plays though. So is it ok for you to mash up public enemy and 19th century Scottish painting? I think so. And how about this track? But the fundamental question – what does this thing from 200 years ago mean today – is such an interesting one. I’ve long been an advocate for the idea that pop music started in about 1820 with the German lieder. But to most listeners today those songs read “opera” not “pop”. So I guess what I’m saying is a question like “what does x mean to us today” is an awful lot about “what’s our worries today” attached to something which has a broad cultural significance. Kinda like today’s politics has me explaining Lear to the offspring. And under that rubric I find your blog entry very interesting as an insight into your relationship with modern Scotland. It’s probably disqualified from having an opinion on whether it’s OK to mash up PE and Landseer. Y’see, I once saw Duran Duran cover PE’s 911 Is A Joke and Melle Mel’s White Lines in New Jersey, and thoroughly enjoyed them both. And while I really appreciated the clever musicianship of Deerhoof’s version of Fight The Power, there is a point at which it becomes a bit uncomfortable for me. Like next week’s post, this is a 600-page satirical novel, not a 600-character comment. I’m not sure that me mumbling Schumann into a whisky glass is today’s pop music (Eh? Oh. ), but I like the thought of Lieder being the early pop. I’ve got Mojo’s Ultimate Music Collection here, and it suggests that The Voice Of Frank Sinatra is the first pop music LP. But that’s more of a format issue, I guess. Nevertheless – and you’ll like this – they also call it the first concept album; a collection of songs about a broken heart. They also compare the arrangements to chamber music. It was remembering this, and playing Songs For Swingin’ Lovers for The Wee Man over dinner – it holds up – that made me feel the necessity for playing a bunch of PE the following evening. So, they were in my mind. How can they not be right now, with Spike Lee returning to the fray and everything? But yes, Lieder. I certainly like the idea of drawing a line from Kurt Weill to Jacques Brel to Scott Walker to Marc Almond. *That’s* pop. Or one version thereof. And this blog entry is absolutely about my relationship with modern Scotland, isn’t it? So… a Scottish Highlands devoid of Highlanders suited the British upper classes quite nicely? Bloody toffs. The question for today is, what are the chances that the Highland population would grow substantially under any future circumstances? Seems like most of the future jobs would continue to be created in the Central Belt. Plus, the energetic and adventurous youth have been gravitating towards city living around the world for many centuries now. Phew! Big topics. I wish I paid more attention to the details of the section of my Twitter feed that focuses on the economics and culture of the modern Highlands and Islands, because the buzz certainly is that there’s a lot going on there. What definitely hit the headlines about a week before this post was that Sutherland had been chosen as the site for the UK’s first spaceport in 2020. (Or rUK?) Couple that up with Glasgow just down the road building more satellites than any other European city, and maybe there’s something there. And then there’s the idea that the Highlands and Islands could be the Saudi Arabia of renewables. Whether that happens, of course, is at least partly down to policy decisions. Not unlike the story of this post. Why have energetic and adventurous youth gravitated to cities? It’s a huge question, says the boy who moved to Manhattan. Huger than this page can handle, not unlike Paul’s remarks on pop music and appropriation. But I love that you’re teasing these questions out!